Fishing is no longer a stranger hobby to many people, but squid fishing is a new challenge, and few people have the opportunity to experience. 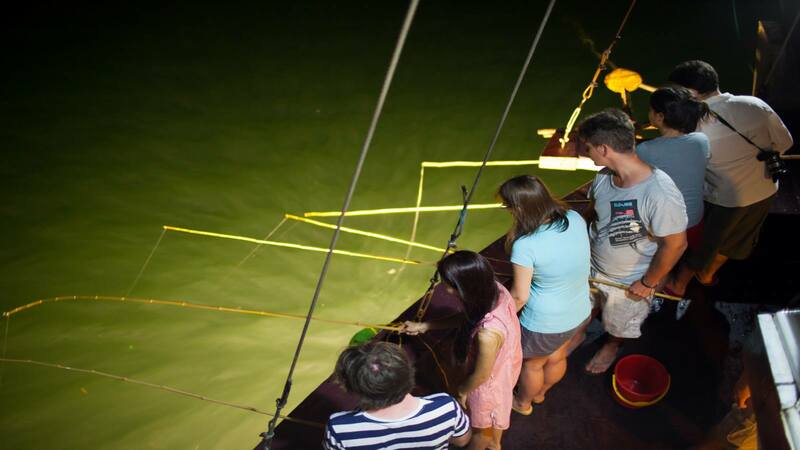 As the result, squid fishing becomes a pleasure that tourists hardly miss in Halong Bay. Previously, night squid fishing was just a livelihood of fishermen, but up to now it has become a rustic pleasure of the tourists on a voyage. It's high time for you to explore night activitites on cruises with Vietnam Typical Tours. If the temperature is low in winter and spring, activities or plays on the beaches are limited, this is the best time for squid fishing because this period, squids are often in huge schools. The best time for squid fishing is spring time, about February to March. And in the summer, if you are bored with the usual activities while traveling, the sea squid night fishing might become a new and attractive choice. Night squid fishing at sea in days of no moon light, hooks are shaped like shrimp, under the light of headlamps; squids shall see hooks as shrimps and obediently snapped their preys. After having dinner, all tourists will have free time to do a lots of interesting activities, such as: dancing, playing games, karaoke, or drinking beer or cocktail, juices sometimes in the bar. However all passengers on cruises staying overnight on the bay shall eagerly wait to attractive activity of fishing squid. From about 9 pm onwards, they can bring squid fishing rod. It’s advised that people shouldn’t choose the lunar day to go but non-lunar days to attract squids to the place of the projector lamp. 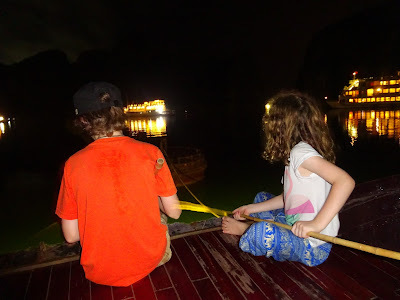 What you need to prepare is a bamboo fishing rod. Its length is about 1 meter with a hook fitted to the fishing line. The top of fishing rod is a small thing sharp. The rod for fishing squid is made of hard bamboo trees. The hooks for fishing squid look like shrimp shape as a fake bait. Especially, squid fishing does not need bait, just need high-voltage lights with white light to attract attention of squids. Today, squid fishing boats are equipped with modern equipment, the giant battery, squid rods and system of high-voltage lights for fishing squids by night. 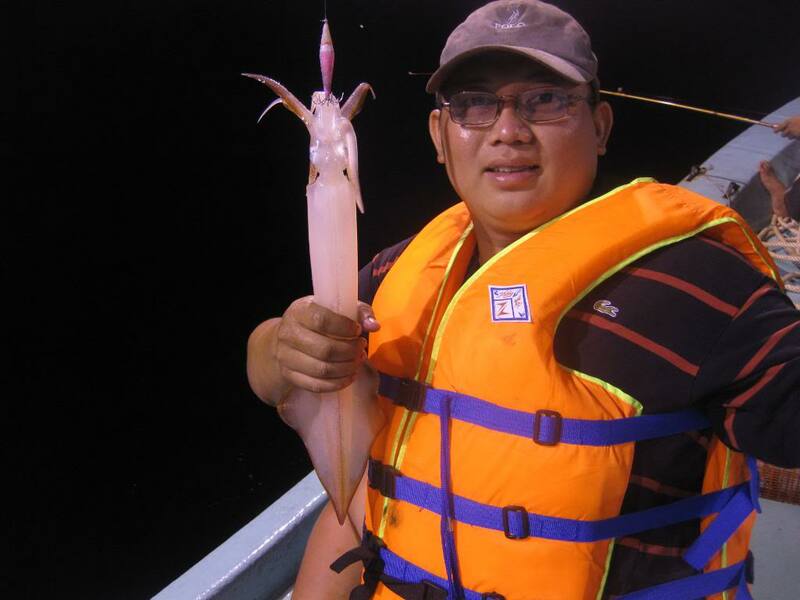 Squid fishing is the special activities on board and attractive many customers. You are recommended to be patient. That is only skill you need to have squid in Ha Long Bay. If you are lucky, you may have even 30 squids/1night. During this time, there is no moonlight at all and squid fishing light is provided on the ship with squid fishing rods, so you just try squid fishing and please tell our Master Chef on ship to keep your squid at the fridge to prepare your own squid food next day. Many customers have done successfully and they were all so happy with their own squids on the next day. Beside, squid fishing is the wonder game to minimized your worries, leave your worries behind and just enjoy how’s Ha Long peaceful and great feeling of the squid fishing at the middle of World Heritage Site. All suid fishing actitivities are held on cruises or small boats, what are you still waiting for? Let find out a suitable ship in Halong Bay Cuises list. We can't wait to see you! Have a nice trip!